Apple's watchOS 4 is officially live, and you can download it now after updating your iPhone to iOS 11. Whether or not you pre-ordered the new Series 3 with LTE, there's plenty of new things to dig into. Not only are there are brand new watch faces, new fitness skills and a way to let you sync your data with gym equipment, but Apple also revealed some fresh new heart rate smarts which will give the Fitbit Ionic a run for its money. If you're wondering what new stuff you can expect in watchOS 4, this is the place to be. Below we've rounded up the big changes coming soon to your Apple Watch. 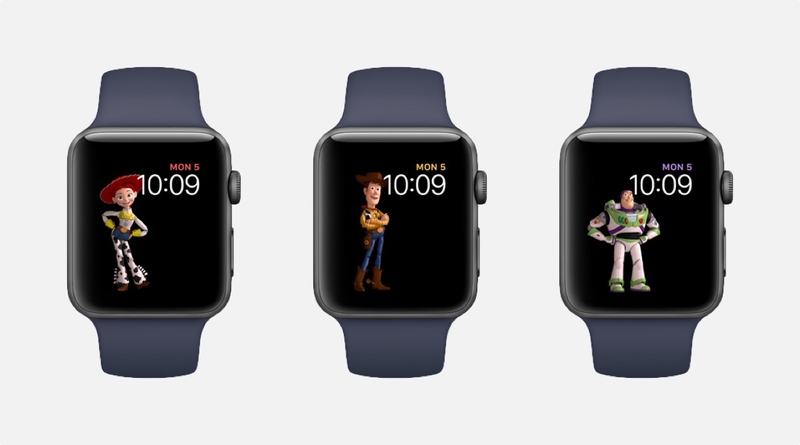 The Apple Watch is getting three new Watch faces and one new complication. The Siri face uses machine learning to tell you the things you need to know in a vertical carousel. For instance, if you've got a meeting in another city there'll be a little box telling you how long it takes to get there. It'll also pull in information from other apps, so if you've got a movie you've got to catch later in the day it'll display the ticket and time right in the Siri watch face. All of this will update on its own. The two other new faces are Kaleidoscope and Toy Story. The Kaleidoscope face is designed to add some colour to your Watch, and comes in three different sizes. When you rotate the Digital Crown the face will get all trippy. And then there's Toy Story. Following up the Mickey and Minnie faces are faces featuring Woody, Buzz and Jessie from Pixar's movie franchise. There are also a couple of new complications. There's the Siri complication, which you can see on the Siri watch face, and there's also Now Playing and Apple News complications. The Now Playing complication is a part of the redesigned Apple Music app. The Apple News complication is a part of the brand new Apple News app, which will let you mark articles to read later on your phone. The heart rate app has done away with the heart beat animation and has been replaced with a graph that gives you more information. There's also a full heart beat complication that'll display your current heart beat on your watch face. In a big move for Apple's wellness suite, watchOS 4 will add a resting heart rate (RHR) feature. This has been a substantial omission from Apple given its device's leaning towards sports and wellness and tracking, and RHR is one of the key ways of tracking your fitness progression. And the heart rate fun doesn't stop there. Recovery after exercise is now tracked – but it remains to be seen how it's actioned on the watch. And the Apple Watch takes a huge step toward being a wellness device. The Apple Heart Study app will see the Cupertino giant detect atrial heart fibrillation, and claims its been working with the FDA. In addition, users will now be alerted when their heart rate increases significantly while they're not exercising, making the Apple Watch a potent first warning to possible serious conditions. The new Activity app is getting just a couple of updates. First, Apple is diving into coaching just a little bit more by introducing monthly challenges to get you pushing yourself. These challenges will be customised to you based on your workout history. You'll also get a ton of reminders and recommendations about your activity levels. For instance, if you're close to getting an Achievement you'll get a notification telling you how close you are. It'll also tell you what you can do to match yesterday's activity levels. When you're closing in on the end of the day and you're super close to finishing off those rings, it'll tell you how long you need to walk before you're done. Apple is also re-doing the animation you get when you close your Activity rings, making it a little more satisfying by adding sparkles. Fun! The most evident change in the Workout app is the new design, which uses the new vertical scrolling design. Outside of the new UI, the swimming workout now has an auto-set mode. Basically, your Watch will be able to tell when you get to the end of the pool and call a lap for you. There's also High Intensity Interval Training support with new motion and heart rate algorithms. You can also link workouts together as if you were training for a triathlon. All you have to do is swipe over to the left and click on a little plus icon to get it going. The most exciting update for indoor athletes is the ability to use the Apple Watch's NFC tech to talk to the gym equipment you use with the newly announced GymKit. All you have to do is tap your watch to the reader on the gym equipment and the two systems will talk to each other. The equipment will be able to get stuff like your heart rate, while your Watch will get all the information from your workout. So if you're a big fan of elliptical workouts, you'll get your incline and speed right on your Watch. No need to hope your Watch accurately tracks your gym equipment workout. This feature will be compatible with gym equipment from LifeFitness, Cybex, Matrix, TechnoGym, Schwinn, Star Trac and Stairmaster. It'll be available in the autumn, when watchOS 4 is live for the public. The Music app is getting a nice redesign. It'll start to pull in Apple Music mixes automatically, so you can worry less about porting your music over via playlists. If you still want to do that, there's now support for multiple playlists - even ones curated by Apple. Speaking of playlists, you can assign playlists to specific workouts. Even better, you can finally swipe up during a workout to access your music. The Apple Watch will also play better with Apple's still-impossible-to-purchase AirPods. One step closer to turning into Apple's secret hearable. The dock has slowly been becoming a more important part of the watchOS experience, and in watchOS 4 it's getting a redesign. Instead of a bunch of panels side-by-side, they'll be aligned in a neat vertical carousel for scrolling through recent apps. There's also a bunch of smaller updates to watchOS 4, and that includes better native core Bluetooth. That means that the Apple Watch will be able to connect to more devices, like Dexcom's continuous glucose monitoring and more. One can't help but wonder if Apple's rumoured smart bands connect the same way. If you've got Apple Pay set up on your Apple Watch, you'll be able to do person-to-person payments thanks to watchOS 4. You initiate it either with iMessage or Siri. All of the money you receive from Apple's person-to-person payment system will be delivered to your new Apple Pay Cash account. You can use this account to pay other people, pay for things in stores or even transfer it to your bank account.